The last time that Susan Spelius Dunning and Peter Henderson got together, it was all lemonade and laughter. When they meet again on Saturday, Feb. 4, it will be an energetic romp piano to piano for an evening recital of piano classics. Henderson, who classical music fans will recognize from his performance last summer with the Sun Valley Summer Symphony's August music series, will perform two sonatas by Beethoven. Dunning will perform a piece last played live here at the same series by pianist Jean-Yves Thibaudet. Then the pair will incite one another into a thrilling night of music to round out the evening. Dunning chatted by email about the upcoming concert and offered a glimpse of what to expect. Q) What happens when you and Peter get together to play? A) Magic. Peter is one of those musicians who makes you feel at your best when performing. He inspires excellence not only with his great technique and musicianship, but also by his elegance, grace and sense of humor. He brings to the music a sense of ease and joy that makes not only me smile, but the entire audience. Q) Is there something about your pairing that people would be surprised to learn? A) Hmmm. How much fun we have in rehearsals? Q) Have you been able to practice together? How? A) We will rehearse upon his arrival—the day before the concert. This is one of the hardships of my living in a community where I am quite isolated from my musical colleagues. Q) How did you select the music? 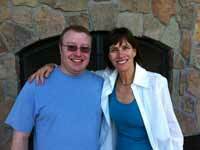 A) We got together for lunch last summer when Peter was here for his Sun Valley Summer Symphony performances. We tossed around a few ideas, drank some lemonade and then shook hands with a big smile. Making music is what we both love to do so passionately. Peter has been a great supporter of our Artist Series since its inception in 2009. Q) How can one get tickets? A) Tickets are now on sale for $35 ($10 students) at www.svartistseries.org and at local Ketchum bookstores. When: Saturday, Feb. 4, 7 p.m.
What: Henderson will perform two of Beethoven's most powerful piano sonatas, the "Pathetique" and the "Appassionata." Following intermission, Dunning will perform one of the piano repertoire's best-loved pieces, Edward Grieg's Piano Concerto. Who is Peter Henderson? Henderson served as orchestral and chamber keyboardist with the Sun Valley Summer Symphony during its 2004 and 2006-2008 seasons, and is active as a performer in orchestral, chamber and solo settings. Since fall 2005, Henderson has also served as assistant professor of music at Maryville University. He performs frequently as an ensemble keyboardist with the St. Louis Symphony Orchestra. His wife, Kristin Ahlstrom, is a violinist with the orchestra. An advocate of new music, he has given several premieres of solo piano works during the past several years. He and his wife live in St. Louis with their willful but charming dog, Zack. Who is Susan Spelius Dunning? In addition to being artistic director for the Sun Valley Artist Series, Dunning is an exciting pianist who combines dramatic virtuosity with sensitive poetic musicianship. Her recent solo appearances have included performing lecture-recitals in Europe and chamber music concerts throughout the western United States and Hawaii. During her most recent European tour, she performed in Scotland at historic locations in Loch Lomond, Nairn and Wick. Spelius Dunning recently recorded a solo CD featuring works by Rachmaninoff, Khatchaturian, Schumann and Chopin. She lives in Sun Valley and Perugia, Italy.